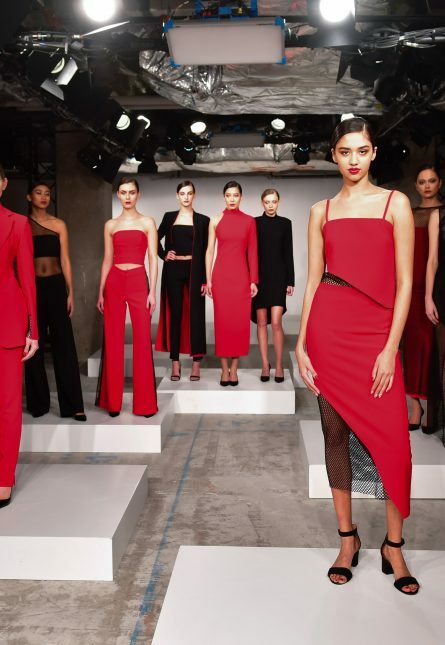 Love filled the air on Day 2 of Toronto Fashion Week at the RE\SET Studio where Tara Rivas showcased her red hot Fall/Winter 2018 collection… and gifted all her attendees a single red rose. Sticking to a black and red colour palette, the Toronto-based designer focused mostly on eveningwear and dresses this season. Standout pieces included a black fishnet dress, a black cape-like coat with red lining and Tara’s favourite piece, a red hot power suit.